It's my birthday!! And check out the spread I got! OK it wasn't for my birthday (it came last week) and it's from the wonderful people at Wholesome Sweeteners. I had been reading about their Organic Zero product online and was very interested. Wholesome Sweeteners Organic Zero is the perfect sweetener for those living a healthy lifestyle. Produced from Organic Sugar Cane Juice, which is naturally fermented and crystallized to create Organic Erythritol. Erythritol is a naturally occurring sugar alcohol that is found in our bodies, as well as in many fruits, vegetables and even certain fermented foods. You all know I use Splenda... and some people like to contact me and yell at me for using it since it's not "healthy" like I say my blog is. Here are my thoughts on the subject if you care to read about them. The thing is I'm always looking for new alternatives and ideas for sweetening without adding a lot of sugars. John tries not to eat things with lots of sugars in them, he will however eat things using splenda, or products that use sugar alcohols like this Organic Zero. Obviously the idea of it being organic without added chemicals struck my fancy, here is some more about it. A glycemic index of zero, so while it sweetens, it does so without adding calories or spiking blood sugar the way other sweeteners often do. Research indicates that for most people, it's highly digestible! 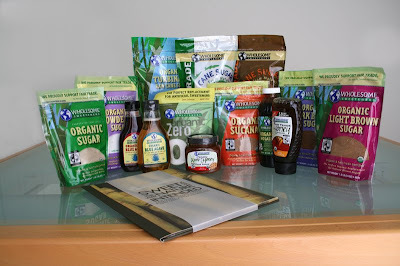 I was very excited when Whole Sweeteners agreed to send me a sample of their organic zero and even more excited when they asked if they could send me some of their other products. Even though John wont eat most of their other products I WILL! And I can't wait to start using these fair traded organic products to make jam, muffins, and try new recipes using agave nectar and sucanat (I've never used either before!). I can't even begin to tell you how much I was dancing around as I kept pulling products out of the box! Seriously generous people!! Thank you so much for giving me the opportunity to test out all these great products! So all you all natural sweetener people keep your eyes open lots of recipes to come!! And if any of you have recipes using said natural products that you love, send me a link so I can try them!! Before the weather got too hot I was able to pump out one muffin recipe.... the cinnamon roll muffins! I subbed their organic turbindo sugar mixed with cinnamon for the topping and MAN it was good. The tops of the muffins had a beautiful sugary crust to them that was delicious! The plan was then to make a batch using the organic zero for comparison... but the house started to become too much of a sauna, so I had to postpone my muffin comparison for a bit. I'm going to make a batch of one of my muffin recipes using splenda like I normally do, and another batch using Organic Zero, then feed them to John and see if he can tell the difference and which one he likes better! So once the temperature drops I'll make both batches and let you know what we think! Until then, go and check out Wholesome Sweeteners! What a great gift!!! I love this brand, I use it regularly in my kitchen. Happy hatch day!!! I hope it is a fun and happy day for you. Hope you have an absolutely fabulous birthday Aunt Stephanie!!! Eat, drink and be merry!!! In case you guys are wondering by John's comment... he did get me a dishwasher and a new kitchen!! But that really isn't my birthday gift. For that he got me a GRILL!!! So exciting, I'll be taking pictures soon and posting all about it :) so fun! Happy birthday, and awesome sweetener package! I'm a stevia fan, but I can't wait to hear how the organic zero works in your recipes. ow...I so want to try these products. I may...occasionally....use splenda in my coffee. I would love a healthier alternative! HAPPY BIRTHDAY! Happy birthday! The sweetener package sounds awesome! Happy Birthday!! Hope it's fabulous. About the sweeteners... You're a lucky girl!! I use the Sucanat in my coffee in the morning. The molassesey flavor (is molassesy even a word?!) gives the coffee a nice taste. Wow, what an extremely generous packaged! Looking forward to reading about your experiments! Happy birthday!! Can't wait to see what you make with your new loot! Steph, I can't believe you get yelled at for using Splenda?! That's crazy!! I personally don't eat it because the aftertaste bothers me, but I think it can be good for saving calories. With all the sweets I eat, it starts to add up! Now I know why you have the added comment to your comments section. I had no idea that people could get nasty regarding the use of Splenda. I've officially been forewarned and will be ready for when my first anti-Splenda comment comes. Venessa I need to pick your brain on what else to use sucanat in! Happy Birthday!!! Hope it was a happy one. What a spread of sweetners you got there. Cant wait to see what you make! Happy Belated Birthday!! Love the care package! !